Earlier today I was reading some posts in one of my parenting groups on Facebook, and I found a post that gave me chills. The woman described how a person in her home was sabotaging her and destroying her belongings with knives and she was upset. She thought maybe it was her kids because they don’t like her and was worried. The more people asked her questions and the more she responded, it became extremely clear that she was married to a sociopath. Every detail was clear, and especially bad. It sounded like the plot of a horror movie. She didn’t use the terms, and she acted like it wasn’t as bad as it was, but she was describing sociopathy, gas lighting, verbal and emotional abuse, death threats, alienation, and worse. She described chronic health problems that left her struggling, then stated that her husband belittled her as not being worthy of her health care expenses. He’d told her she was a drain on their finances and she was worthless. Her kids told her the same. Sickening. Many abuse victims don’t realize that these horrible behaviors have names, nor do they realize just how serious these things are. To them, it has become normal. Maybe they don’t know that someone could treat them better. This woman’s description of what was happening to her was so scary, I almost replied that there was a strong chance we were going to see a story about her murder on TV. That bad. In fact, Criminal Minds had an episode that sounded a lot like this woman’s life. From the sounds of it, she was being bullied, minimized, and belittled by her husband who was also teaching and encouraging her kids to do the same. She was stressed and depressed from all the attacks she was enduring, and they used that to degrade her even more. It was a tale of very serious sociopathic abuse. Unfortunately, most people equate sociopaths with obvious serial killers rather than their own sickly abusive spouses. She posted looking for help in our parenting group because she didn’t feel safe with her own family! There was obviously something bad going on. None of us knew her, so she obviously wasn’t trying to smear her husband. Most of the people replying understood this and encouraged her to get help. However, there is always at least one jerk who comes along to hurt people who are already hurting. One person responded that no wonder her family didn’t like her because living with a victim is annoying. Wow. You know what’s even worse? Actually being victimized and bullied by an abuser who teaches the kids to abuse. THAT is far more than “annoying.” The reality is, if someone is abusing you, you are indeed their victim. You don’t have to be happy about it, nor are you at fault for it. Another jerk chimed in that we didn’t know the whole story, and maybe this was some crazy woman have delusions that her husband was being mean to her because she was off her meds. I’ve had people say that about me. You know who said it? 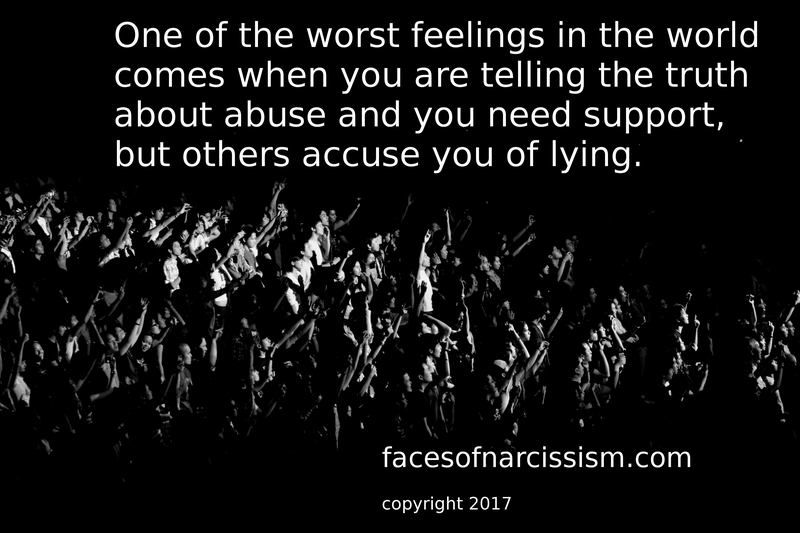 My diagnosed sociopath ex who was abusing me badly and telling his flying monkeys I was nuts. It is a HUGE red flag. 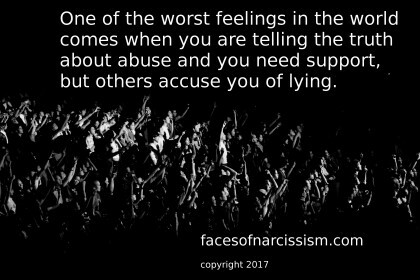 When someone is telling tales of abuse, our normal first reaction should NOT be to blame them for not liking the abuse, nor should it be to assume they are nuts or that they are causing the abuse. No one causes abuse except an abuser. Yes, real sociopaths do indeed play victim; however, when sociopaths do it, they usually do it in front of people the victim knows to make their target look bad. They have no need to be in support groups or to tell strangers. They play victim to smear people, so it’s pointless to seek anonymous help from strangers. Real victims go to support groups and seek help from third parties because they really do need help! The whole exchange was awful. The two bullies were minimal, and most people understood the woman was in an abusive marriage. Sadly, only a few people realized it was beyond plain old abuse and into demented sociopath territory. I hope the lady listens to what the wiser people said and escapes soon.